When sophomore midfielder Harrison Matsuokah scored with less than a minute on the clock, Stony Brook Men’s Lacrosse appeared on the verge of a comeback. After scoring six consecutive times against No. 9 Virginia to draw with one, Stony Brook needed to work fast in order to completely erase what was once a seven-goal deficit. Unfortunately for the Seawolves, the hole was too deep to climb out of. 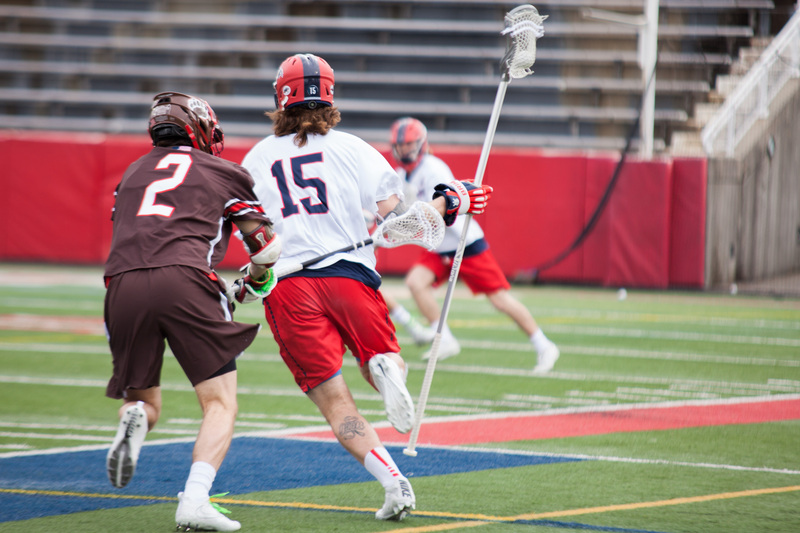 Stony Brook’s 15-14 loss Saturday afternoon at Kenneth P. LaValle Stadium dropped its 2018 record to 1-5, the program’s worst six-game stretch to start a season since 2012. Though the result was less than desirable, the Seawolves showed encouraging signs of life in their would-be fourth quarter comeback. After going down three goals to Virginia in the opening five minutes, Stony Brook scored twice in the first quarter and ended the half down by just one goal. The Cavaliers scored early and often in the third quarter, however. Virginia junior attackman Mikey Herring beat sophomore goalkeeper Michael Bollinger 49 seconds into the third to extend the team’s lead. Herring’s goal was the first of eight for the Cavaliers in the quarter, and sophomore attackman Michael Kraus tacked on one more early in the fourth for his team-leading fifth goal of the contest. Junior long stick middie Justin Pugal scored 12 seconds after Kraus’ goal to kick off Stony Brook’s comeback attempt. Six Seawolves found the back of the cage over the final 13 minutes of the game, including sophomore attackman Connor Grippe and sophomore attackman Tom Haun, who both completed hat tricks with their fourth quarter markers. Grippe’s hat trick was the first of his collegiate career. He was one of four Seawolves with a four-point performance, along with Haun, freshman midfielder Mike McCannell and freshman attackman Jack Walsh. Twelve Stony Brook players collected points in the contest, but individual success did not amount to a team victory. Virginia edged Stony Brook 43-29 in ground balls and 22-8 in faceoffs. Despite the Seawolves’ 46-43 advantage in shots, they were unable to overcome the Cavaliers’ early lead and trailed for the majority of the game. The Seawolves will look to turn their season around on Sunday, March 18 when they head to Maryland for their matchup with UMBC. The game is scheduled for a 12 p.m. start at UMBC Stadium.